I have decided that from episodes 30-159, I will probably break them up into groups of 5. It’s a daily drama. A lot happens and yet a lot doesn’t. So I think the next post will be for 30-34. This may speed up the process. Or not. We’ll see what happens. I wonder if there will come a point in which I shall ever like Saewa? She wasn’t too horrible to begin with, but she made the switch to evil witch quite fast. If she does end up unhappy with Do Jin. I would say that is her just desserts for the misery she has visited not just on her own family, but Donghae’s and Bongi’s as well. 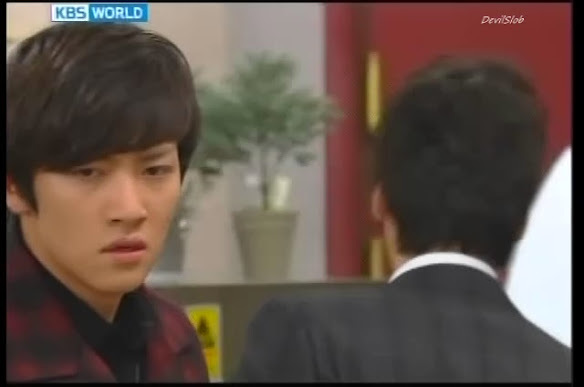 Saewa is still in shock and wondering just why Donghae is with Kang Jae. She has locked herself in her room and refuses to answer the door. Meanwhile, Sun Ok tells Bongi that Donghae went with her father to deliver cabbages to Sool Nyeo. Say what? This makes Bongi panic. Has Donghae met with Saewa? What should she do? She then gets an angry call from Saewa demanding to know if that was really Donghae or not. Bongi, obviously lying, says she wouldn’t know and promptly hangs up. Well, that took guts on one hand and on the other, sooo not convincing at all. Bongi is relieved to know that Donghae and Saewa didn’t meet face to face while Saewa rushes out to confirm whether its Donghae or not. So Saewa stalks Kangjae and Donghae to the Lee house. She is angry that Bongi has lied about Donghae all of this time. Sun Ok and the girls come out saying they wish to go to the public baths and invite the boys along. Kang Jae says that Donghae and Anna should go, too. This interests Donghae as he’s been to a Korean sauna, but not a public bath yet. Everyone leaves saves for Bongi and Donghae and Bongi asks him if anything strange happened. Like what? Bongi quickly changes the subject and tells him to hurry and leave. After Bongi leaves, Saewa comes in demanding to know what is going on. This floors Donghae. Yep, psycho ex-girlfriend has turned into a stalker who believes she has the right to dictate others lives if they get in her way. Do Jin takes the rattled Hye Sook home and says he has turned Mr. Kim into the cops for his underhanded dealings and trying to hurt Hye Sook. She asks after Carl Laker (aka Donghae for those who don’t remember). Do Jin says that no matter what, he hates the sight of Donghae. Hye Sook reminds her son that it was Donghae who rescued her from that bad situation earlier. Okay. So I do know the storyline very well even if I haven’t finished this series. I can understand that they are building an intrinsic hatred of Donghae in Do Jin for various reasons, but sometimes it gets annoying to have such animosity with no valid (at this point) reason. It’s one thing to have someone rub you the wrong way and not be the nicest or what not, but Do Jin is actually pretty vicious when it comes to Donghae. Sigh. The writers make things too obvious at times in daily dramas. If we need further proof that Saewa is NOT in her right mind, all we have to do is watch her with Donghae. She immediately thinks that Donghae has stayed behind in Korea and is plotting against her in some way. Donghae points out that he and Saewa are nothing now so what he does shouldn’t matter. Besides, he can’t forget how she treated Anna. Saewa again demands to know just what he’s planning. Paranoid, much? Well, I guess when you do dirty, underhanded things, its only natural of you to suspect everyone else for having an hidden agenda, too. Donghae then says he’s searching for his father and his roots and Saewa has no say in his life any more. Saewa does her evil smirky look and says that if he should stand in the way of her plans, she won’t have it. Um…yeah. Again, need you more proof of Saewa’s psychosis? Then in walks Sun Ok and Bongi and they are shocked to find Saewa there. The girl quickly lies that she was thanking the Lees for the cabbages and then she leaves. Sun Ok goes to get her towel and Bongi drags Donghae out into the alley where she finally tells him about Saewa being her sister-in-law. This upsets Donghae. If he knew that the Yoon family and Lee family were connected, he wouldn’t have brought Anna and stayed with them. Bongi says that Donghae and Saewa have broken up and are both adults, so what should it matter that the families are related? Donghae then worries about what happens if the Lees find out about his and Saewa’s past relationship. Bongi points out that her parents won’t know unless they tell him, and their lips are sealed, right? Plus, Donghae saw how Saewa lied earlier, so you know Saewa won’t tell them. Bongi also points out that Donghae has done nothing wrong to his ex (nope, most of the blame lays with Saewa on this one). Sool Nyeo returns and stumbles over the cabbages. Tae Hoon tells her that they are a gift from his father so that Sool Nyeo can make kimchi. Sool Nyeo tells him that they buy their kimchi and don’t make it. Tae Hoon tries to gently tell his mother that they should make kimchi out of the gifts anyways, but Sool Nyeo snaps that Tae Hoon can do it if he wants to. So Tae Hoon looks up kimchi recipes. Sae Young comes in and asks why they just don’t have Sun Ok make the kimchi. Tae Hoon cannot believe his ears. Why would his mother make kimchi for the Yoons? That’s not something she should have to do. Sae Young then replies why not since Sool Nyeo lets her work at the salon. Omo. Talk about insensitive. Okay. While Sae Young is NOT horrible like Saewa, she is so immature and is in need of a good reality check. The next morning at breakfast, it’s discovered that Anna is unwell. She doesn’t wish to go to the hospital as they have no insurance, but Donghae insists that she does. Pil Jae also pipes up and says he doesn’t want Song Yi getting sick, so it’s best if he takes Anna to the hospital himself. LMAO. I love how he uses his daughter as an excuse so he can be close to Annao. Of course, him doing this isn’t helping as it really paints him in a bad light to everyone else. Donghae then gets a call from Hye Sook asking him to pay her a visit. When he arrives she thanks him for all of his help. Talk about some fate they have to keep meeting. Hye Sook then asks why he was at the hotel and Donghae replies he was looking for a job in the kitchen. Hye Sook immediately offers to help him as it’s the least she can do. Donghae initially refuses, but then caves in. Needless to say, Do Jin is NOT a happy camper when his mother asks him to talk to the head chef. Seeing Do Jin’s strong objections, Donghae requests to put his skills to the test. Bongi is shocked when Donghae is introduced to the staff. He is then put in Dae Sam’s care. Of course, Dae Sam foists helping Donghae onto Bongi who can’t be more happy to have Donghae in the hotel’s kitche. They go to the market to prepare ingredients for the upcoming dinner test. Donghae tells Bongi about how he loves to cook, but never thought about doing it as a career. It was after he lost his mom that he realized he wanted to do whatever she wants as long ash e could have her back safe. That means finding his father and becoming a strong support (i.e. having a job), so he needs to pass the cooking test and win the competition. As they are leaving the market, they see Kang Jae being rejected by a store owner. Donghae goes to rush in and help, but Bongi stops him. Her father wouldn’t want them to see him in such a sorry state. Back at the Lee house, Bongi apologizes to Donghae as she will also do her best to win the competition so that she can give her father a better life and help him restart his kimchi factory. Donghae does not mind this as he knows that Bongi’s family is as important to her as his mother is to him. They both promise to work hard and do their best. Bongi then gets a call from Sae Young saying that Tae Hoon is attempting to make kimchi. This shocks Bongi and she rushes over to the Yoon house. Sool Nyeo is fretting over how to tell Sun Ok about Saewa marrying Kim Joon’s son. After all, it was Kim Joon’s report that destroyed Kang Jae’s kimchi factory. Should she tell Sun Ok now or later? She decides now and takes a toy snake with her that kids were playing with. Why she grabbed it is a mystery. On her way to see Sun Ok, she comes across Pil Jae and Anna returning from the hospital. Pil Jae even piggybacks the weak Anna! This, of course, incenses Sool Nyeo. What is her perfect man doing with another woman? She follows them and when Pil Jae goes to get Anna’s prescription filled, she attacks her with the rubber snake. Of course Pil Jae comes back at that moment and the frightened Sool Nyeo goes rushing off. Well, it could have been worse. But if Sool Nyeo’s already behaving like this, how can she keep her word to Hye Sook about behaving properly? Sool Nyeo runs into the Lee house and then uses their bathroom. At that moment, Anna and Pil Jae return. This shocks Sool Nyeo. The man she called dibs on is really Sun Ok’s freeloading brother-in-law? Of course Sool Nyeo wishes to remain hidden in the bathroom, but fate would have it that Pil Jae needs to use it before work. So Sool Nyeo charges out of the bathroom and the Lee house to make sure that Pil Jae doesn’t recognize her. LMAO. I guess crazy kind of runs in the Yoon family. Although Saewa’s cold calculations are definitely worse than Sae Young’s childish selfishness and Sool Nyeo’s own childishness. Saewa is getting ready to go out when she has a slight kitchen mishap with Tae Hoon who was trying to make kimchi. Of course, Saewa puts all fault on her brother-in-law (they both weren’t paying attention to their surrounds so they are equally to blame). She lights into him about wasting time making kimchi instead of studying or finding a job so he isn’t a useless bum. Ouch. Of course, enter little sister Bongi at this moment and boy is she livid. Can’t say I blame her as her older brother is getting cussed out and he isn’t 100% deserving of Saewa’s acerbic tongue. Bongi demands an apology, but Saewa refuses. Bongi reminds her that no family wants their eldest son living with their in-laws or being treated like that. 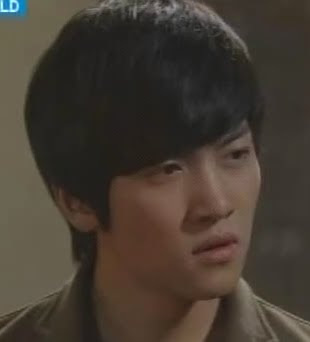 Saewa tells Bongi to take Tae Hoon back. Bongi again demands an apology. If Saewa doesn’t apologize, then Bongi will leave nasty comments on the broadcast company’s website about Saewa’s true nature. This angers Saewa even more and makes her more convinced that Donghae and Bongi are plotting something. Of course, Saewa also brings up Bongi liking Donghae yet again. Why else would Bongi do what she’s doing for him? Saewa’s fine with their relationship as long as Bongi doesn’t mind her throw aways. I seriously cannot find anything likeable about this character. Yes, we all know by now that Bongi does like Donghae. Of course she won’t admit having those feelings for him to Saewa, but she does tell Saewa to stay far away since she’s already done a bang up job of ruining Donghae’s life and hurting him. Saewa sees Donghae and offers him a ride. Donghae refuses, but Saewa manages to convince him. She proceeds to tell him that she’ll find him a place if he wants to stay in Korea, so he can leave the Lees’ house. Or if Donghae goes back to the States, she will find James in Donghae’s stead. This annoys Donghae. They have nothing more to do with each other, plus he doesn’t need her help. Donghae then tells her he’s in a hurry and needs to get to the Camellia Hotel quickly. This shocks Saewa. Why would he be going to the hotel? It’s for revenge isn’t it? Say what? Donghae says that Saewa is really funny. Why on earth is she being so sensitive? He then has her pull over and he tries to get a taxi to make it in time for the test. Stupid Saewa. 15 minutes past the scheduled test time and Do Jin calls it a failure since Donghae didn’t care enough to show up on time. Poor Donghae. Of course neither the chef nor Do Jin will give him a second chance. Thanks, Saewa. Can you ruin is life any more than you already have? Do Jin reports this to his mother who is disappointed as she didn’t peg Donghae for that type of person. She then tells Do Jin she wants to bring his father dinner. It makes Do Jin very happy to see his parents finally getting along after all of these years. In the kitchen, Dae Sam is supposed to be preparing Kim Joon’s dinner, but he sliced his hand open. While he’s tending to his wound, Donghae makes the lunch for him. I have never seen anyone put asparagus on a sandwich before. It’s weird. Anywho, Donghae delivers the meal to Hye Sook. She tells him she’s sorry about him missing out on the test and Donghae says he’s upset about it as well. He then asks for a second chance even if he doesn’t deserve it. Cooking is all he has left and he needs to provide for his mother. He then hands over the meal. Meanwhile, Joon is recalling memories of Anna when his wife arrives with Donghae’s prepared lunch. Hye Sook then says she needs Kim Joon’s honest opinion as it could make or break one man’s future with the hotel. Joon isn’t a picky eater, but nor will he praise food if it isn’t good. So Donghae’s lunch will be judged fairly by Kim Joon. Later, Joon tells the staff that he’s looking for a host for the upcoming cooking competition. Of course Saewa announces she wishes for that position. I can’t wait to see how that disaster plays out. The angry Do Jin storms into the hotel kitchen and demands to know what happened. Dae Sam explains about his injury and Donghae says he offered a helping hand to someone in need. Do Jin then reveals the good (but bad news for Do Jin) news that Donghae is now a member of the kitchen staff for a three month trial period. This makes both Bongi and Donghae happy and they share a hug in the locker room. They are such a cute couple that are obviously made for each other. Love this show in all its cheesy and corny predictability! Ok, it is official! DoJin and SaeWa are driving me insane! Who does SaeWa thinks she is? Donghae is right, they have no ties anymore so he can do whatever he wants. The hell with her being so nosy of him. DoJin childish behavior is intolerable. What? He’s the VP Manager of Service? Geez…. he definitely need to be serviced!